Guildford hand-cyclist Rachel Morris says fellow Briton Karen Darke deserves to share her Paralympic bronze medal. The duo crossed the finish line of the H1-3 road race at Brands Hatch hand-in-hand but Morris was awarded bronze. Morris told BBC Surrey: "It wasn't done in any planned way whatsoever. The pair of us had worked so hard on that race. "We worked tactically together for the first time, which was fantastic. It felt very wrong one of us going over the line without the other." 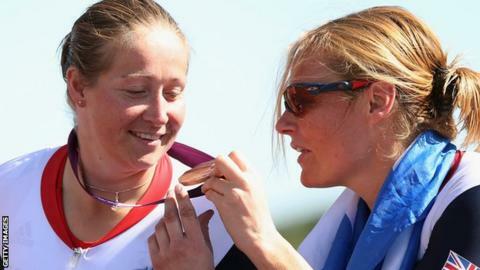 The Beijing gold medallist added: "It was the best but hardest I have ever done, and Karen also says the same. "We pulled away from the Swiss, who we have never managed to beat, and weren't that far behind the Americans." Morris says making third place in London is a great achievement after she dislocated her shoulder in a training accident in July, and was forced to buy a new hand-cycle in time for the Games. "I cannot tell you how much this bronze medal means," the 33-year-old continued. "In some ways it means more than my gold in Beijing. "There has been a real core of five or six people that have made an incredible difference in me getting to these Games. "It hasn't been the easiest year, especially not the last five or six weeks. By achieving what I have done this year, it has fulfilled quite a lot." Morris now has an eye on competing at the next Paralympics, in Rio de Janeiro in 2016. "I'd love to go into it with the perfect run-in to the Games," she said. "I'd love to prepare for it absolutely properly and have none of the difficult ups and downs I had this year. "I'd really hope to be able to go whether it's cycling or another sport. That will be my absolute goal."